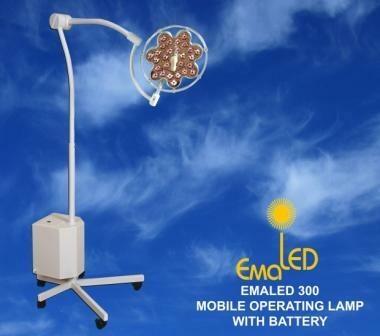 The movable EMALED 300 mobil is for examination and treatment rooms that do not need a permanent examination light. With a lighting power of 100 000 lux and a working field of 60 mm, this light makes sure that there is a shadow free lighting of the surgical area. The light of 28 LED’s, a near sunlight spectrum of 4200 K and a good color rendering index of 92 Ra make a contrast rich and detailed view of the wound possible. Due to the “cold” light of the light diodes without infrared and ultraviolet rays there is only minimal heat with the EMALED 300 mobil. The low use of electricity and the long life span of the light diodes (min. of 40 000 hours.) assure low operating costs by the daily use of the light. The comfort of the easy to move and simply to attach lighting heads in connection with the unhindered movement of the horizontal axes and the built in power supply with an accumulator of 4 hrs. 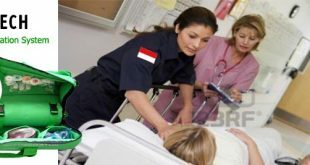 without electrical connection guarantees a safe and easy use of the examination light EMALED 300 mobil.